The Winchester Family Business - Nate Winchester's Supernatural Remix: "Ask Jeeves"
Nate Winchester's Supernatural Remix: "Ask Jeeves"
Time for another installment of Nate Winchester's Supernatural remix. Up this time, "Ask Jeeves." Sorry we're late, we got lost on the way here. We did? I thought we were trying to talk the writer into going out on a high note of the 200th episode. Oh I thought he was just lazy. Ix nay! So what do you need us for? I need you two to help solve.... a murder! That would be your partner ringing our doorbell. Yes madam always loved her novelty doorbells. Please, this way. Who do you think is going to die? I don't care as long as it's not one of us for once. Why is everyone here dressed in black? Oh good call butler dude. I don't know what you've heard about hunters, but we need to be called sooner to actually prevent death. Unless you want her back REALLY bad. In which case Dean's got a coupon book and frequent customer card of Hell. He's right though. One more soul sold and I get the toaster oven. No you, IDEEOTS! Madam is not the victim. One of these attendees will be! Oh another guest must have arrived. Hey dude, sorry we're late. We got really lost on the way here. We're the totally heterosexual guys who have lived all our lives together and now work hard to stop bad people and save innocent lives. Who are you two? We're totally heterosexual guys who have lived all our lives together and now work hard to stop bad things and save innocent lives. Well I only need one of you. Which pair is the one with the psychic? Look I don't care. Whichever pair stops the murder will get paid. I thought we were the only private eye firm pretending to be psychic. What do you mean, 'pretending'? C'mon guys. We're all professional here. You don't have to fake it around me. No he really had legit psychic powers. Yeah, but I was cured. I didn't know you could cure psychic...ness. It does if you die. Apparently. You're walking around pretty good for a dead guy. Yeah, my brother sold his soul to revive me. But turns out that was all part of a long plot involving a demon releasing Satan from hell. Shawn! Can I talk to you a moment? Would you ever sell your soul for me, Gus? No. That's what I'm telling you. I think we're in the wrong TV show. How do you know? Maybe they're the ones in our TV show. We should ask them something only we would know. Hey guys. You guys ever work with Timothy Omundson? Dean... I think that was some merchandising. No. We best use our Supernatural Oijia board to find out the truth. <-- CLICK NOW TO BUY!!! Sam! You're doing it now! Let's ask Cas for help! Hello? I'm a murderous shapeshifter and nobody's even tried killing me yet. Never mind that, get out now before you're merchandised! Wait, how would they do that with a shapesifter? It's worse than we thought! Get out now! But I wanted a tshirt with my face on it. Trust me, it's overrated. Move! Who could be behind this, Dean? I love it I liked Ask Jeeves anyway, it is the most entertaining episode this season (not necessarily quality etc, but entertainment value) to date. This is a fun addition to that. pation that gets to you. Interesting question though - it would be fun to see Sam and Dean on various shows with people trying to convince them that they are on the wrong show ... with examples ... that don't work cause SPN has done everything, had most actors that are available at the moment, and has a gif for everything (see Tumblr). Yes I ran out of characters before I ran out of SPN people ... while Jensen could certainly manage the gold shorts (I am pretty sure there are gold shorts ....) with aplomb I think he deserves a better character - or one who gets more songs at least ... and then there is Misha and that leads to a whole new kettle of fish and it all gets way too complicated. Heh, I thought that was Sting in 'Dune' ... or maybe it's Sean Connery in 'Zardoz' ... Terrible costumes through the ages: A short history. Yep, Rocky is the only one with the gold lame. Oooooh, and gold lame boots, I'd forgotten about those. Somehow Tim Curry still manages to look sexier in fishnets and bustier. Hah!! Tim Curry. I almost forgot for a moment that he WASN'T in the episode! Great work. 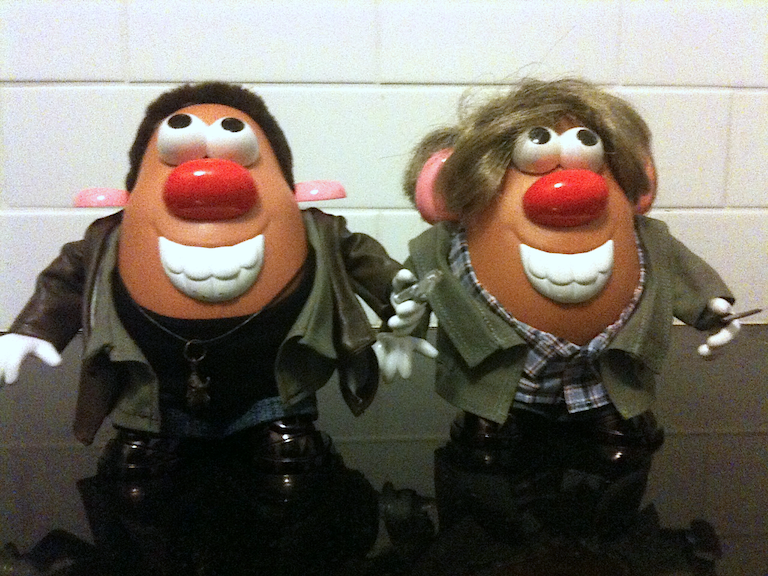 The merchandising is creepy and icky… the Cas doll is especially weird. Gimmicky trinkets are so not my thing. Definitely took a twist that I didn't see coming! Good job with tge tie ins!!! I love the pictures you always chose to use!!! I always look forward to your remixes!!! Where have you been?!? You have been missed!